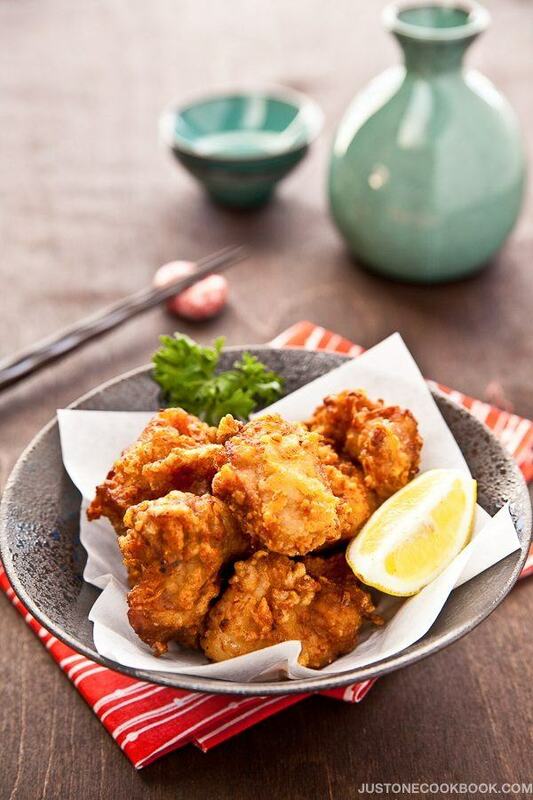 Karaage is Japanese fried chicken that is fried to perfection with a crisp texture on the outside and super juicy and tender on the inside. Karaage (Japanese Fried Chicken) is a popular appetizer or main dish at home or restaurants and often f0und in a bento box. 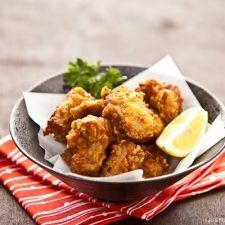 Today I’m sharing more garlicky flavored chicken karaage recipe than my original Chicken Karaage recipe. Both karaage recipes are pretty similar, but if you enjoy strong garlic flavor, definitely go with this one. In Japan potato starch (or katakuriko 片栗粉) is most commonly used as a coating for deep frying instead of corn starch. I was using corn starch when I first moved to the U.S. because it was easier to find at regular American supermarkets. As we often substitute corn starch for potato starch or vice versa, I didn’t think too much. However, when I compared potato and corn starch side by side by rubbing them between my finger tips, I noticed they are quite different in texture. So I’ve decided to make karaage with these two types of starch and see which karaage tastes better. As a result, I found out that potato starch seemed to be crispier and had a nice crisp texture when I bite into it. That’s something we look for when we eat karaage in general. If you cannot find potato starch, corn starch is still your best option. However, I think it’s worth your time looking for potato starch for this delicious karaage. Are Potato Starch and Potato Flour Same? No, they are not the same. Potato starch is made from the dried starch component of peeled potatoes while potato flour is made from whole (raw or cooked) potatoes being dried then ground into flour. Pat dry the chicken with paper towel. 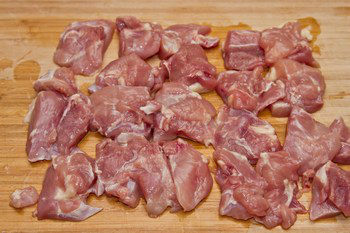 Cut each chicken thigh into 2 inch pieces (so that deep frying time is about the same). Season with salt and freshly ground black pepper. Put the chicken in a large bowl or Ziploc bag. Grate the ginger and mince the garlic (with garlic presser). Combine the chicken and all the seasonings in the bowl (or Ziploc bag). Cover with plastic wrap and rest in refrigerator for at least 1 hour. Bring the oil to 320-338F (160-170C). Meanwhile combine potato starch and flour, and whisk all together. Right before the oil is ready, add the potato starch and flour mix to the chicken. You do not need to mix it evenly. The uneven coating gives each piece its unique texture. Gently drop each piece of chicken separately into the oil. Do not overcrowd. Deep fry 3-5 pieces at a time. If you put a lot of chicken in the oil, the temperature will drop quickly and chicken will end up absorbing too much oil. Cook for 90 seconds, or until the chicken is cooked through and outside is light golden color. If the chicken changes color too quickly, then the oil temperature is too high. Either put a few more pieces of chicken in the oil or lower the heat. 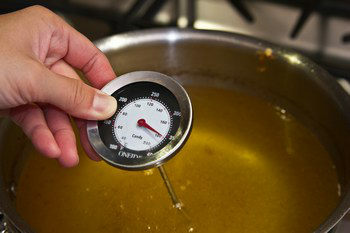 Controlling oil temperature is the key for deep frying. Transfer the chicken onto a wire rack to drain excess oil. While resting on the wire rack, the chicken will continue to cook with the remaining heat. Between batches (or even while cooking), make sure to pick up crumbs to keep the oil clean (otherwise oil will get darker). When you finish all the batches, then bring the oil to 356F (180C). Deep fry for the second time for 45 seconds, or until the skin is nice golden color and crispy. Transfer the chicken onto a wire rack or paper towel to drain excess oil. Serve the chicken immediately with lemon wedges. Ohh, Nami. It`s like you can read my mind on what Japanese food I love! Ok, so I’m a bit biased but outside of the south, Asians just know fried chicken! Case in point, your Karaage!! Looks incredibly crispy and delicious—you’ve got me salivating over here, my friend!! Potato starch will now go on my grocery list! This fried chicken looks AMAZING, Nami! That little basket is genius, I need to find one. The chicken looks delicious. I love any kind of fried chicken, so I’m excited to try the Japanese version! Oh Nami, these chicken look so crunchy and appetizing but look very tender and moist inside. I love the the idea of putting more garlic in it. This something perfect with cocktail or beer. yummy! Nami, I just love your Karaage, sounds so delicious! Thanks for sharing all the tips for a perfect result. Pinned! Have to try it! I remember your other chicken karage, Nami – and the more garlic, the better! Frying really is the only way to get it good and crispy, but I’m going to try potato starch on my version of un-fried chicken and see if it helps to make it crispy. I’ve never used potato starch but I always put potato flakes and cornstarch in my dipping mix for onion rings. I’m definitely going to give this a try. These look delicious! I love fried food 🙂 just not the frying so much, but I can do this. I even have potato starch! This chicken looks irresistible, Nami!! Beautiful photos :). I think the idea of using potato starch is brilliant!! We love “karaage” and your sure makes me drool over here during lunch hours. Will try this out soon!!! karaage is so popular these days! i am from pakistan i think potato starch will not available here. Nami, I love the sound of this more garlicky version! We are both huge garlic fans so this version would be brilliant! 😀 Thank you! Oh how scrumptious Nami and if potato starch produces a crispier result then potato starch is what I will try and find. Thanks for sharing your experience with the different starch types, I hadn’t had the chance to try it out for myself and was in fact wondering about the differences. I feel like going and making your chicken karaage now. Looks fantastic! 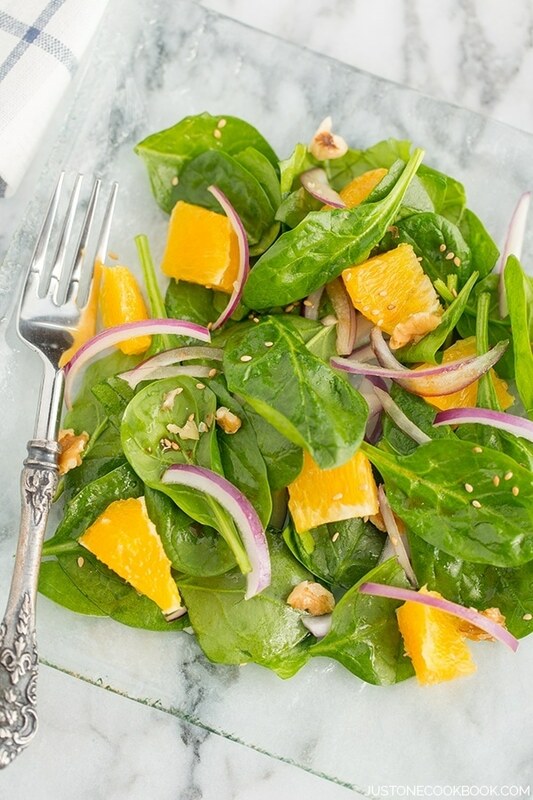 Thank you for sharing this recipe and such beautiful, clear photos! It makes reading your blog such a pleasure! my daughter loves fried chicken in whatever form. I bet she will love this! oh that is very clever. I didn’t think 90 seconds was long enough to cook a piece of chicken – how clever. It looks really scrummy, Nami. It’s breakfast time here, but I WANT SOME!! This recipe is inviting. I like that all your recipes are very easy to make and you explain the whole procedure very well. l will try karaage on Saturday night! By the way I tried your “Miso seabass”, only I used a different fish because I could not find seabass, both my husband and I loved it! i love karaage!!! the only time i ever made didn’t taste quite right.. and i’m afraid of deep-frying! but lately, i’ve been thinking of giving it another shot with your earlier recipe since i finally bought/found sake ^^ now i know i have to soonest! I am drooling! Looks so good! I have been craving fried chicken all week: this looks SO GOOD!!! Nami, it looks marvellous! I think I have already told you how much I love karaage, but now that I see a garlicky version, I think I will love it even more! I am crazy for garlic (I don’t know such a thing as “too much garlic”) so I am happy you have posted this version. I have never heard about garlicky karaage. (And yes, I agree, deep-frying is the only way to obtain juicy karaage; I have tried oven but it doesn’t work). This must be delicious! I want to try it! Why fried meals have to be so good? I didn’t know there is a starch made with potato, I can imagine the results should be better than with corn starch, but is good to know that we can use it as I’m not sure here we can find the potato starch. Beautiful. I have never fried chicken before, but when I do, I’m using your recipe. Such beautifully detailed photographs and prose! Thank you for sharing. I finally got my google reader working and your feed is the first one I entered! this is my all time favourite Japanese dish because i just love fried chicken, hehehe..and i love to enjoy Karaage with shredded cabbage and mayonnaise..yum yum! yours look absolutely cripsy and delicious! I love this recipe! It will be easy for me to adapt it to gluten-free for my daughter. Thank you for sharing the recipe. I don’t know if I could stop eating this! You are SO right – that good fried chicken has to be fried! I’ve had both baked and fried and there is no comparison. 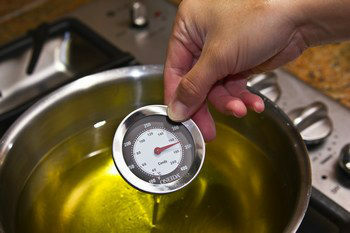 As long as you get the oil hot enough (as you show), it doesn’t absorb that much fat. So frying it is! I’ve never used cornstarch nor potato starch with fried chicken. I’m going to have to try it. Love the seasonings you use. This is definitely a must try recipe! What a perfect crispy chicken. Frederick is a HUGE fan of Japanese food, so I often make karaage from time to time. I agree, potato starch make the results different. Yummm! Now this is what I would call fried chicken done right! Your seasonings are heavenly Nami and even though I don’t do very much frying (your method looks excellent), I might steal your recipe and transition it to breadcrumbs/oven cooking. Not the same, I know… but a comfortable approximation that I think might work quite well on this end. Lovely recipe! OH MY GAAAA. I want to eat all of these. I would love to try these crispy, garlicky bites of deep fried chicken one day. I have never used potato starch. 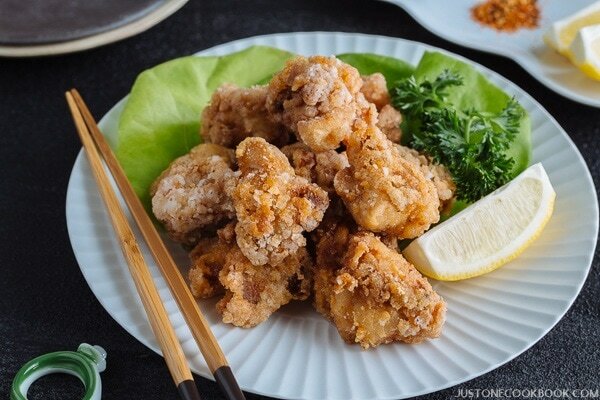 This delicious looking chicken karaage would be the best recipe to try it with! Fantastic, love the way you show us the recipe step by step with the pictures . Those Japanese fry chicken will make a great party hors d’ oeuvres!!! Note to self – don’t stop by Nami’s blog when it is 1:45 and you haven’t had lunch yet. What I wouldn’t do for a big plate of this right now. Yum, Nami! You have the best fed kids around for sure. I have a dislike for frying foods. The reason is that I always burn myself so I don’t want to do it, lol:) Your chicken looks absolutely scrumptious! My husband and I would love this. I’m going to ask him to do the frying though. Hehe! We absolutely adore chicken kaarage….may never attempt it at home though – scared to deep fry! I can always be talked into eating something fried! I don’t believe I’ve ever had a fried something coated with potato starch before – interesting idea. And I love the seasoning on this – really good stuff. Thanks. Dear Nami, I have potato starch at home and I just bought organic chicken-) Thank you for wonderful idea and we do love garlic a lot! What kind of sauce would you use for this dish? I love fried chicken and would love to try your version. I am wondering if I could substitute the potato starch for cornstarch. This would be such a great appetizer. Would go so well with beer. Yummy, I am craving something fried! this chicken looks so good! next time i see potato starch, i am grabbing some and making this – YUM!! Ooooh!!! A while ago, when I was writing a column for my school newspaper, I wrote about the different culture’s fried chicken, and kaarage was one of them!! Yours look delightful, Nami! I love this dish when we eat out at Japanese, but have never tried making it at home. I must try it. Yum yum, crispy chicken with wasabi mayo! Hehe, Nami I think I am starting to recognize your Daiso dishes, as I have a few and planned on buying that green small vase myself 🙂 I love that place! Anyway, this looks really good. Potato starch is actually pretty easy to find here, so I think I’ll give this a try before we go-afterall, my husband LOVES fried chicken and we don’t make it often either. Very interesting Nami. Now you’ve got me curious to do a comparison as well. Although I never fry foods anymore my husbands favorite dish up until 3 years after we were married was fried chicken. It would be fun to fry some up for him to see what he thinks. I have to admit yours looks pretty tasty and nice and crispy! Okay I’m totally trying this. I love anything fried, and this looks incredible. Great recipe and photos Nami. Making me hungry for dinner and it’s only 9:30 am. I’ve never used potato starch, just corn starch and arrowroot powder. I love it when I learn something new! These look crunchy and amazing! I agree, if you don’t eat fried foods everyday, it’s okay to indulge! YUM! A little deep frying every once in a while is fine with me. However, these look so good I know I’d be tempted to have them more often. good for you for being able to take pictures while frying 🙂 the chicken looks delicious! Some of the best things in life are deep fried. Yum yum! I don’t deep fry often but if I do, it is usually chicken. Nothing like it. I must try your seasoning for this karaage as I love garlic and ginger together. Beautiful chicken! Great tutorial with photos. Oh, Nami, this is just so wonderful – the recipe is clear and precise, the photos are wonderful, the ingredients are easy to find around here and the chicken looks so utterly delicious – who could resist immediately trying out this terrific looking recipe. I am most definitely hungry now and I would so much like to enjoy a piece of your Japanese Fried Chicken! Nami, you sure know how to make us hungry! Great comparison between potato starch and corn starch. Back in Malaysia, my mom often uses potato starch for deep frying too. I haven’t found potato starch near our area either, so I’ll be interested to look for one once we move closer to the City. Oh yes, you gotta enjoy these chicken karaage deep fried! Hi Nami! I’m looking forward to trying your karaage. 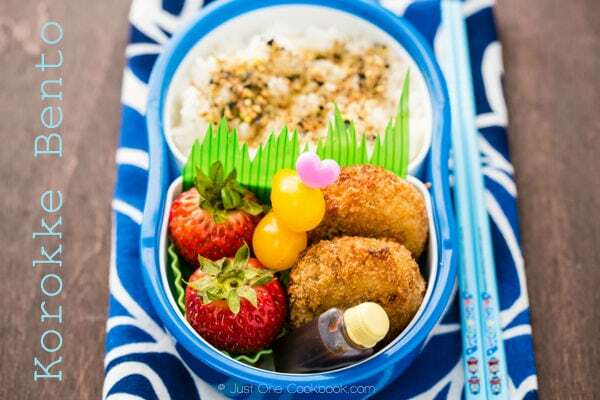 I used to love eating Japanese fried chicken as part of bento boxes. Gorgeous photos! Oh this is awesome – I’ll definitely go with the more garlicky version, I’m a sucker for garlic. This is getting added to my to-try list. I haven’t had good luck with frying chicken so far (or good skills lol) but I love the idea of doing a double fry to make it extra crunchy. Nami – this looks and sounds amazing! I so love learning about the Japanese cuisine from you! My mouth is watering and just wish I had a bowl of these delights in front of me right now. Hope your week is going well!! Did you mention garlic? These are amazing, Nami. Nami, this looks SO good. I don’t do a lot of deep frying but this recipe is tempting me to make an exception. Thanks for sharing it! Oh my goodness this looks heavenly! Anything with loads of garlic is a big yes in my kitchen! Oh my, that looks too DELICIOUS!!!! I want!!!!! Garliky is fine by me, this looks really delicious (is my dinner ready?). There are tones of Asian markets in my city so finding this starch with be a breeze. Nami, I cannot resist fried chicken. These golden nuggets of perfection are calling to me. It sounds like it is worth seeking out potato starch for that extra crunchy texture. Your photos and styling are mouthwatering as always. I’ve watched many videos on how to make chicken karaage, but yours looks fresh, crispy, and juicy from inside. I love the clicks and can’t wait to try it. Those sound (and look) very delicious, Nami! Question, have you ever used coconut oil for the frying? Do you think it would be good too? Oh yum!!! 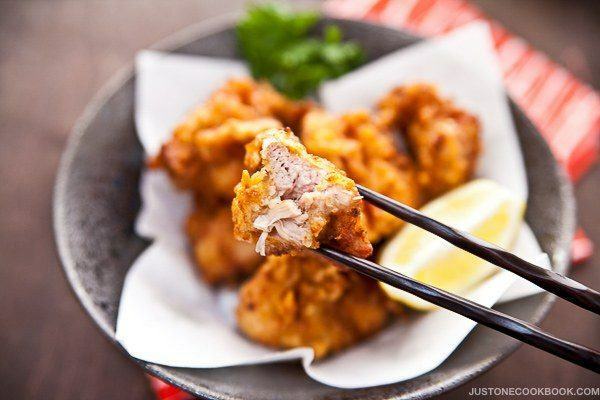 Who would be able to resist such yummy karaage! It wouldn’t be a good idea to bake them but now there’s the air fryer. Wonder if it’ll work with that? I like that you’ve used chicken thighs in your recipe. I like chicken breast, but the thighs just seem to be much more tender and moist. I can see why your son loves this recipe! That is one of the most delicious fried chicken I have ever seen Nami! Looks so good that I am actually getting hungry now. I think we have potato starch here and that makes me happy because I can make your fried chicken! Oh wow. Karaage Chicken has got to be one of my most favorite things to order out at Japanese.. Its probably a good thing I don’t have a deep fryer though otherwise I would be deep frying everything. haha! I am drooling! This looks so crispy and delicious. Potato starch? Great tip! Hi there. This is my first comment on your recipes though I have tried a few already. 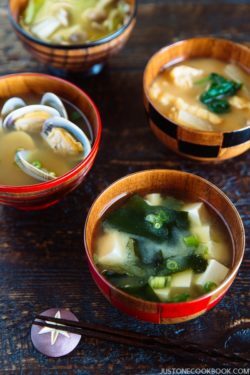 Just this past week I made dashi, tonjiru and sukiyaki using your recipes and they were amazingly authentic and total sellouts with hubby and my for kids. Your stunning photography certainly helps to trigger the taste buds even before the food is ready! So this comment is to thank you profusely for your contributions. I have a quick question. I love your ginger grater! Where did you get out from? Hi Angie! I’m really happy to hear that you enjoyed my recipes that you tried! I need to retake tonjiru and sukiyaki pictures soon as they are not so appealing…but thanks for trusting the recipes and give them a try! Ohh that ginger grater! I LOVE IT. My mom has been using that for years and I had to ask my mom to buy one and send it to me (or she might brought it with her last time). It’s nice enough to serve like that to table too. It’s made of ceramic but I have grated ginger, daikon, etc. I actually found it online… I don’t think it cost this much though. Here’s the link. I’ll be trying this for sure, deep frying in coconut oil, to see how it turns out! 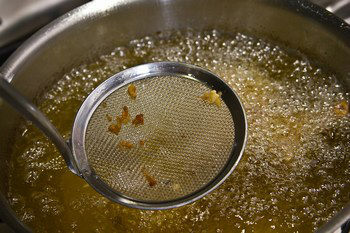 Hi,how many times do you advise to use the same oil for deep frying and which type of oil do you recommend? Thanks. Hello Janice! It depends on the condition of oil after I deep fry, but if it’s clean enough I usually strain the oil and use it another time within a week. I recommend vegetable oil, canola oil or corn oil. More information about deep frying here. I have a gluten intolerant friend and this is great because of the potato starch vs cornstarch, however flour not so much. do you think i could substitute this for rice flour? Hi Brittany! I’ve seen GF flour in Trader Joe’s, but I’m not sure where you locate and maybe it’s hard to find. I am pretty sure you can use rice flour to substitute flour, but I have never made karaage with rice flour and I cannot guarantee the same result with the rice flour. If you use it, would you please let me know how it turns out with rice flour? 🙂 Hope you enjoy! I’m from Australia so I dont know what that is, I have seen GF flour around the place but i didnt realise that the recipe called for flour. seems simple enough as well! I want these now. I saw on the pinterest and they are making me hungry! I had chicken karaage at a local food truck earlier this month and it was delicious so I was so pleased to see this recipe on pinterest. One trip to our Asian supermarket for potato starch and I have my chicken marinating in the refrigerator. I can’t wait for dinner! I tried using the corn starch and it doesn’t look that appetizing as the one in the photo. I guess that’s one difference with the potato starch. 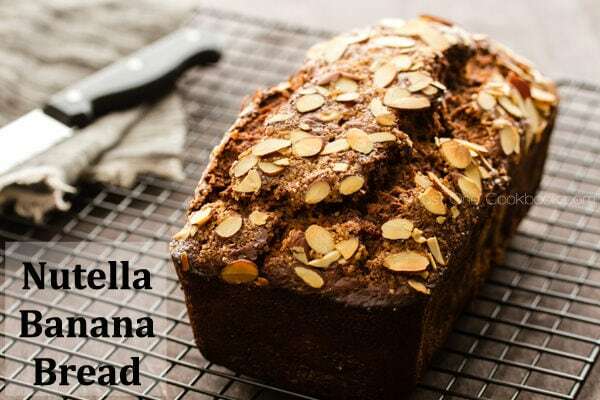 The recipe is overall delicious and I can’t wait to try more of your mouth watering recipes. Cheers! Hi KiimChee! I’ve used corn starch for sometime when I couldn’t find potato starch, and I have to say I really like how potato starch gives nice texture to the chicken karaage! Hope you can find potato starch and try again. 🙂 Thank you for writing! This recipe is amazing! After living in Japan for 6 years, karaage became a favorite and I always am getting it at Japanese restaurants. I had no idea how easy it was to make at home myself!! I also am a firm believer that there is no such thing as too much garlic, so this recipe tweak was perfect for me! I was surprised how quickly the chicken cooked too! I used a small deep fryer instead of a pan and it worked just great! Thanks again for this great website and all the recipes that even I am able to do!!! 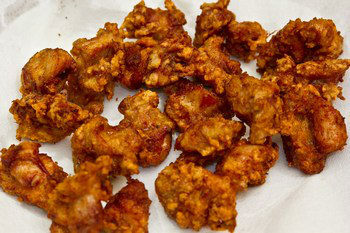 Hi Nami, I have recently tried out this Karaage recipe, very nice & my family loves it. Thanks for sharing with us. So good to know a great Japanese cook around. Hi there. In my experience, potato starch can be found in the kosher foods section (if your supermarket has one). Hi Jason! Thank you so much for letting us know. I had no idea we could find in Kosher foods section! I’ll definitely inform readers if they can’t find potato starch. Thank you!!! I am SO going to try this! I’ve never used potato starch before, but I definitely want to look for it now. And if you use the “healthier” types of oils like peanut oil, there should be no harm in frying it. Hi Ethel! 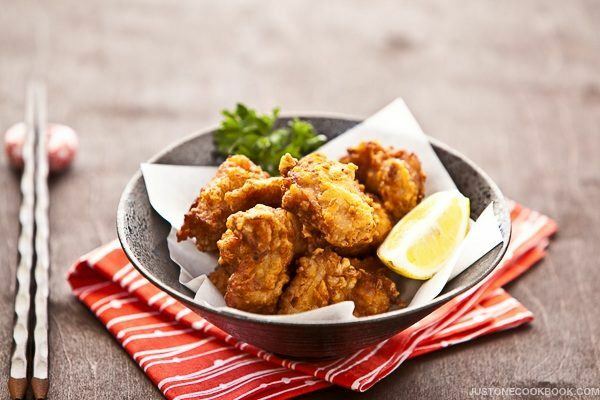 I hope you like this karaage recipe! Hope you can find potato starch, but if not, corn starch will be okay too! Enjoy! I made these for dinner with my boyfriend today and they went deliciously well with Korean fried rice. The boiling oil scared us a bit at first, but the results were so worth it! It was very crispy on the outside but moist and tender in the inside. Hi Nami, thank you for recipe. I love chicken karaage. I will have to try it out soon. I have been using your other recipes and they all turned out wonderful. 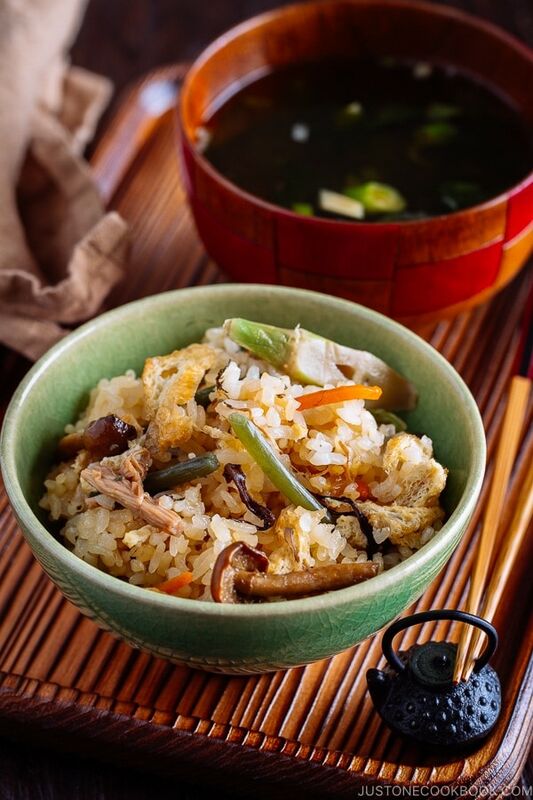 Thank you so much for sharing them- I have been searching high and low for authentic Japanese recipes but had not found them until I stumbled upon your page and your recipes are very easy to follow and so delicious ! I’m so grateful ! I hope you will have time to add more yummy recipes to your collection. May i ask what is the other flour mentioned in your recipe. Is it AP flour or cornflour? Hi Michelle! Yes it is all purpose flour. Thank you for asking! Thank you for your prompt reply. Got another qns to ask, if i don’t have sake or dry sherry, what i can replace with? Thanks. As a foreigner in Japan, yours is my go-to page for accurate recipes to satisfy my husband. I made this karaage but accidentally left it to marinade for 2 days. The results were the best fried chicken I’ve made to date. Thank you! My husband is a United States Marine and he used to be stationed in Japan. He ate at a place called Hokka Hokka Tei A LOT. All I know is it is a famous bento restaurant there. He is in the states now and he craves their chicken there. I have been on a mission to find a copy cat recipe to the chicken he loves there so much. They are called fried chicken balls. It was fried chicken in the shape of a ball served with a packet of lemon. Would this be most likely what they served there? If you have ever heard of this place I would love to know more about how to cook or make that chicken. 😉 going to try your recipe soon. Thank you for the fast reply. My husband’s mouth is watering after looking at that pic. 😉 Thank you so much. Thank you for this wonderful recipe, I tried it with chicken tendons today and it turned out really delicious – much better than what we ordered from restaurants. Thank you! I was wondering why you use sake with chicken? What is the effect of sake? I’ve noticed it in a lot of Japanese recipes. Ever since I found your blog, this has been my go to place for Japanese recipes. My husband had lived in Japan for a year some time ago, and we travel there whenever we have enough money and holidays saved. Both of us are big fans of Japanese food (and always have our luggage packed with food stuff when we leave, haha). I have tried many of your recipes, such as tonkatsu, oyakodon, gyudon, onsen tamago, yakisoba, okonomiyaki… All have become regular dishes on our dinner table. And I love your tips on how to substitute items in Japanese pantry. Here, up north in Finland, ingredients can be hard/expensive to find. Today, I tried your karaage recipe for the first time. And wow, the juiciness of the chicken pieces were simply amazing! Hi Hama! Thank you so much for your kind feedback! I’m so happy to hear you like Japanese food! Thank you for trying my recipes! Hi, I’ve followed all the instructions here but always end up with soggy chicken skin, am I doing something wrong? I have a thermometer so I’m sure I got the temperature right. The only thing is that I use different starch, but I’ve experimented with cornstarch (with the same result, soggy skin). Turns out it is from the starch that I used (sweet potato starch) which acts differently that potato and corn starch. Thanks for the reply! Will this recipe work in an Air Fryer? Since I’m in Japan, I picked one up. I’m lousy at frying…never turns out right! Hi Nami! I like that your recipes are so easy yet very delicious!! May i ask if i can prepare it early and fry it once then keep it in the refrigerator then fry it again for dinner? Will i get the same juiciness and crispiness? Or can i keep the chicken in its marinade for days? Will it taste the same? Thank you! Hi Nikki! Thank you so much for your kind words. 🙂 So there are few things to consider. 2) Double deep fry works when it’s back to back. As soon as you keep it in the fridge, the chicken is cold. So I think, it’s hard to deep fry to keep the inside moisture and outside crunchy. So try to deep fry at the same time. When you do 2nd deep frying, the chicken should be warm, so without making the deep fry oil go suddenly cold, you can maintain the hot oil to crisp the outside karaage texture. Looks like your best bet is to marinade one day before. You can make the seasoning even ahead of time to save time. Start marinating the night before, and deep fry on the day. Or, you finish cooking – freeze (if it’s a couple of days ahead), and use a toaster oven or oven to re-heat. I do that for kids’ bento. 🙂 It’s not like freshly deep fried, but sometimes there is no other choice. 🙂 Hope this helps! Thank you for sharing so many recipes. I tried so many that I lost count 😀 one question that I have is which recipe should I follow for karaage since the seasoning is different. I was thinking about using eggs, onions and negis like in the old recipe but the simpler version looks so tempting. Out of curiosity, why fry twice instead of once ( longer time)? Sorry if it’s a childish question. And finaly, thank you for helping aspire people to cook and learn about other cultures food and history. You puts lots of hard work into this website. I wish you the best ! 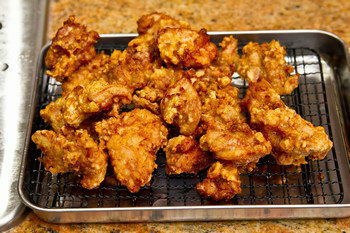 just stopping by to say thank you for sharing this recipe Nami, my daughter loves karaage. Hi Jojo! I’m so happy to hear your family liked it! Thank you for your kind feedback. 🙂 Yes, I’ll continue to share more Japanese recipes with you and JOC readers. 🙂 Thank you for reading my blog! Hello! I was wondering if it is possible to do something so that I can leave the chicken in the fridge for a shorter period of time, say around 10 min? I only have 1 hour to make a dish so I was hoping that there is some way I can still make this! 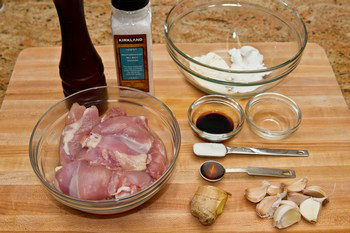 One more tip, make sure to poke chicken with a fork so favors go in more! but i could really need some tips on sauses or the like to go with it, as just plane rice on the side gets a rather boring ;( and eating just karaage, however good…. as they say to much of the good stuff IS too much of the good stuff. Hi Birger (I’m curious how you pronounce it. [beer-ger]?)! 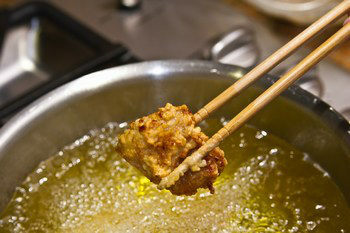 Karaage is “usually” eaten by itself, as it is seasoned/marinated before deep frying. We don’t overpower the flavor with sauce, not to mention, we want crispy karaage. First time cooking chicken karaage tonight and it tasted so…… good. Thank you for sharing such an amazing recipe!! Hi Wai! I’m glad you liked it! Thank you for your kind feedback! Hi Nami, Thank you for your recipe! I love the addition of garlic. It’s my fav version of karaage yet! So I marinated a double portion of chicken with the intention to leave it in overnight and fry it for lunch tomorrow. However, I later read that leaving it too long in the soya sauce mixture will draw out too much moisture from the chicken (!!) I’m now torn between frying it as a midnight snack or leaving it in the fridge as an experiment., I hope it won’t turn out overly salty or lose too much moisture! Any advice? Thanks! Hi Fiona! If it’s a Japanese recipe (made by Japanese cook), you might notice most of marinate time is not overnight. 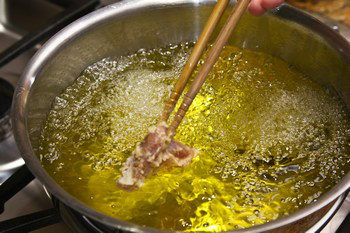 It’s common to marinate 30 to 60 minutes for Japanese cooking. I know other Asian cooking marinate for a longer time, but I think Japanese like to keep the food’s original taste and not overwhelm with the seasoning. In general though. There are some overnight marinate recipes BUT salt level should not be too much. In your case, since you already marinated… why don’t you add a bit more sake to dilute a bit? Before you deep fry, pick up the chicken pieces and transfer to a baking sheet or something big and then sprinkle potato starch (don’t put potato starch in the marinade). You don’t have to dry with paper towel etc but this will at least get rid of some excess liquid. Hope that helps! Hi, Nami, thanks for your wonderful recipe. May I know please what kind of dipping I should serve with Chicken Karaage? All the best! The rinsing the chicken step seems unnecessary. Back in the old days people used to rinse chicken to “clean” it, but modern food safety says that’s unnecessary and the rinsing actually spreads raw chicken juice around the citchen which is obviously a bad idea. 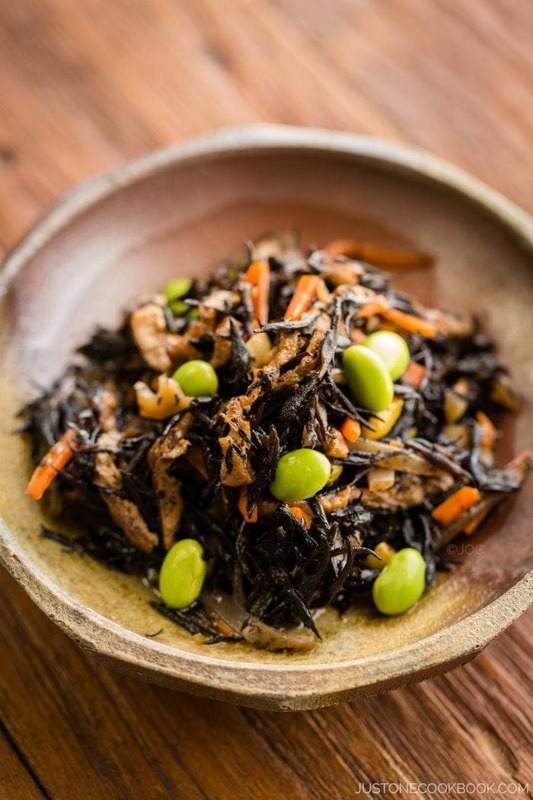 Do you use dark soy or light soy sauce for this? hi I am starting work soon and need exciting lunches that wont cost me much. With this fried chicken, can it be frozen and for how long? If using a microwave, how long would you say I’d have to reheat it for to keep it safe to eat? Would it work if I substituted chunks of tofu instead? Hi Laura! Here are my answers to your questions. 1) I freeze my karaage too (in fact my kids lunch tomorrow is defrosted karaage). Since it’s deep fried it’s best to be used in 2 weeks or so as oil oxidize and it won’t be tasty. 2) I do not recommend using a microwave to reheat deep fried food. It gets soggy and won’t be crispy. Use your oven or toaster oven (that’s what I use – super convenient) to make it crispy. You will see the food gets oily and looks like exactly you just deep fried. Then you can finish reheating. To pack in lunch, I recommend to cool down so it won’t get soggy with condensation. Hi De LM! I’m so sorry to hear that. You can easily change this to GF version. Use 100% potato starch by replacing flour with potato starch. Use GF soy sauce (Kikkoman has a good one). Then you can still enjoy this delicious dish. I may create a separate recipe one day, so it may help people who search GF version. 🙂 Thank you for your request! I made this last night for dinner and it was delicious! I made enough so I’d have some left for a bento for lunch today, but it was SO hard to resist just eating the whole lot last night! Thanks Nami! Potato starch is in the Kosher section of your supermarket – Especially during Passover (April) it is in the Passover Section with the rest of the special foods. Thank you for the information, Shirley! Thank you so much for your recipe. I cooked this tonight and my family enjoyed it. It cooked up crispy and the flavour of garlic and ginger was really nice. I should say I used cornflour as that is what I had on hand, when I get my hands on potato flour I will write to you again. hi. this looks tempting. what sauce usually goes with it? I like the method of double-frying the chicken. This seems similar to making fries, where the first time in the oil partly cooks it, and the second time makes the outside super crispy. I also like the tip to scoop out the oil periodically. I’ve seen bits of fried crust on the bottom after frying, but didn’t think anything of them. But, it makes sense that these bits burn the longer they’re in there, darkening the oil (and making it more bitter). Thanks for sharing! I’m in the process of setting up a food blog, and I like the way you have things on your site. How can you call this gluten free when there is wheat flour in the recipe (“all purpose flour”) ? Thank you Nami so much. I followed this Karaage and my husband loves it much. These turned out great! The flavor was spot on, and I think the use of katakuriko/potato starch was key. One minor snafu that I did run into was that my chicken pieces were not fully cooked through after the first 90 second fry (which I didn’t realize until I had finished all of the initial fry batches). To fix this, I had to fry the chicken for a longer period of time for the second fry – I think they turned out just fine, but a good reminder to make sure the chicken pieces aren’t too big. Thank you so much for this recipe! Thank you for trying this recipe Emi! If you prefer bigger karaage pieces, then we have to start with slightly lower heat (not low heat, just slightly lower) so the chicken won’t burn too fast which make you worry aobut taking it out faster. Either way works, but it’s easier with smaller pieces. 🙂 I’m glad to hear you enjoyed them. Thank you! Made this tonihht. This turned out amazing. I actually cooked it in my actifryer airfryer. Was delicious. Had some Karaage last night at a restaurant, and the one I made tonight was on par. This was seriously delicious and very easy to make. I never fry food at home but I love Karaage and always wanted to make good fried chicken. This turned out better than at most restaurants. Thank you for sharing this recipe. I’ve been trying all your recipes and my LO liked them. Wondering, can I use air fryer in this recipe? Instead of deep frying? Hi Dor! Thank you so much for trying this recipe as well as others from my blog. I’m so glad to hear you enjoyed them. 🙂 Some JOC readers told me they used the air fryer and it worked really well. I don’t own one so I can’t testify… 🙂 Hope you give it a try and let us know! 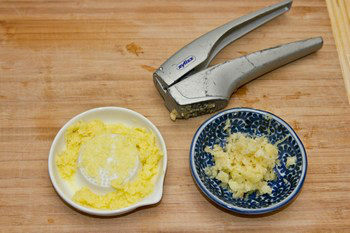 I didn’t see this in any of the other comments I got to…if someone else mentioned it then my apologies: Instead of using a garlic press, i just used the same micro plane I use to grate the ginger. It produces a kind of thicker slimy paste with all the other flavoring ingredients. I felt it helped capture the garlic better. What are your thoughts on this? I made this dish for my family on my own. And they absolutely loved it. I am a huge fan on Japanese culture and food and I can’t wait to make other recipes too. Hi Catherine! I’m so happy to hear you enjoyed this recipe! Thank you for your kind feedback and I hope you enjoy cooking Japanese food at home! Arigato. I will enjoy cooking Japanese food. And I hope to travel to Japan one day. Thank you! I just made it tonight – it’s one of our family’s favourite meals. Paired it with fresh steamed rice, miso soup and a crunchy salad. Oh, and a cold Asahi of course! Just like a lot of good things in life, it takes some time and prep – but well worth the effort. Just wondering— can I make this with 1) chicken breast or would it be too dry? And 2) would this taste good air fried? Hi Susan! Here are my answers. 1) Chicken breast is drier than chicken thigh, but you can definitely use it. 2) I don’t own an air fryer so I can’t really tell… Sorry!